There are several choices for hotels that are near CMU. When you call the hotel to make reservations, please tell them that you would like the CMU rate and based on availability, they will try to honor the prices quoted below. Map showing location of many CMU area hotels. Rates: $60 from the airport to Downtown, Oakland, Shadyside, and Squirrel Hill (sedan). The rate for a van, a 14 passenger vehicle, is $78.00 per hour. Mention CMU when making a reservation. Rental Car available at the airport from all the major companies. Leaves CMU from the corner of Forbes and Morewood Avenues every 20 minutes starting at 5:00 a.m., last shuttle at 10:40 p.m. Shuttle leaves the airport from the baggage level starting at 5:45 a.m. approximately every 20 minutes. Find info on possible delayed flights from the Flight Delay Information - Air Traffic Control System Command Center web page. Directions to CMU from the airport and other directions. Detailed map of CMU campus and area. Many of the PDL folks are on the 2nd floor of CIC, and our data center, but others have offices in the Gates Hillman Center. Location of Hamerschlag Hall, Roberts Hall (Singleton Room) and the CIC building which houses most of PDL's personnel, plus our new Data Center. . Parking is available along Frew Street. Street map of the Shadyside/Squirrel Hill area of Pittsburgh (CMU's next door neighborhood). Due to various circumstances, such as campus-wide events and the number of validation tickets already reserved, Parking & Transportation Services has placed the following restrictions for access to the East Campus Garage. The dates and events are noted below. In addition to the dates listed below, there may be additional days when the garage will be open for lease holders and event attendees only. Please mark your calendar, or bookmark our homepage (https://www.cmu.edu/parking/index.html) and check back frequently for any updates or changes. 1. Blackout dates for validation ticket requests for the East Campus Garage. 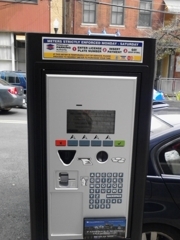 Tthere are parking machines on Schenley Drive, Frew Street, and Tech Street which are all very near to Roberts Hall. They accept currency and credit cards; it is ~$3.00 / hour and uses your license plate as the timing factor -- there should be plenty of spots still available at that hour. 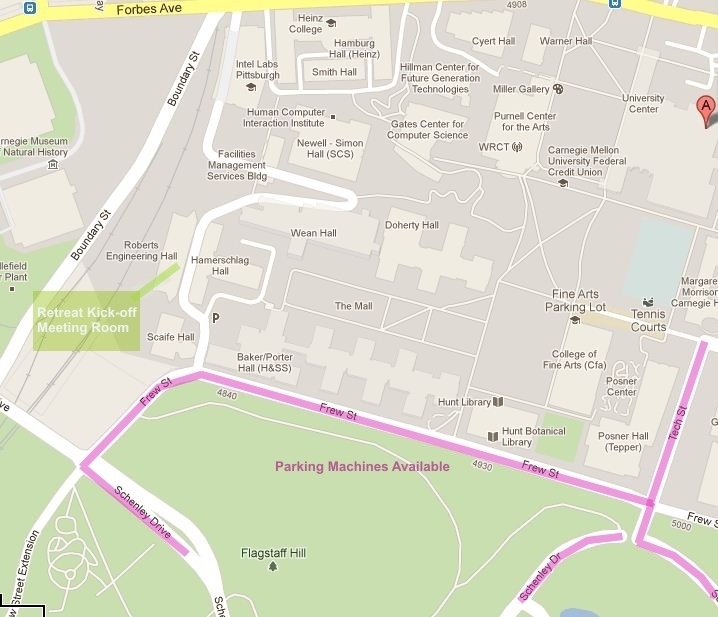 Parking is also available in the RMCIC Building Garage - P4 on the general campus map (closest) or the East Campus Garage - P7 on the map (further walk but more familiar to some of our guests). Some past attendees have also used the parking lot on Forbes Avenue at the nearby Carnegie Museum (also shown on the map). If you have any questions, please ask Karen. Another map showing parking available on and around the CMU campus. looking for parking in the Oakland area? Find lot locations, open spots and prices, etc. Most of the hotels listed offer scheduled shuttle transportation for their hotel to/from CMU. When you check in at your hotel, please let the front desk know of your need to get to CMU and your desired arrival time. They will inform you what time you should be in the front lobby for the appropriate shuttle. For the Spring Visit Day and / or Retreat Day (NOT on the Optional Talks Day the day before Spring Visit Day), Karen will send around a pre-paid, non-hotel shuttle (arrival times to be sent close to the event) to get all guests to CMU around the same time. It also avoids the “makes many stops at other places for other hotel guests” pain of the hotel shuttles. When you check in at your hotel, please let the front desk know of your need to get to CMU and your desired arrival time. They will inform you what time you should be in the front lobby for the appropriate shuttle. Please ask the shuttle driver to drop you off in front of Hamburg Hall. As you depart the shuttle, the CIC Building will be the building directly to the right (west) of Hamburg Hall over the ravine. Turn left up the road between Hamburg and CIC and you will find the main entrance to CIC on your right. Inside, the elevators are to your left and you will find most of the PDL personnel located in offices on the second floor. Greg Ganger is in CIC 2208 (412-268-1297) and Karen Lindenfelser is in CIC 2209 (412-268-6716). When you check in at your hotel, please let the front desk know of your need to get to CMU and your desired arrival time. They will inform you what time you should be in the front lobby for the appropriate shuttle. Please ask the shuttle driver to drop you off at the 1st Floor entrance to Wean Hall. They can enter CMU via (Roberts Drive) off of Frew Street (by Schenley Park and Phipps Conservatory). The driver will need to follow the road between Roberts and Hamerschlag Hall down and around the back of Hamerschlag Hall, past the sidewalk leading up to Hamburg Hall/Forbes Avenue and proceed to the bottom of the hill (you will see parking spots along the sidewalk), and let you off at the stop sign at the bottom of that hill. Please come through the door (1st floor of Wean Hall). Walk to the end of the hall, turn right, and take the elevator to the 8th floor. If you are going directly to the conference room, Wean Hall 8220 can be found in the hallway behind the elevator. Turn right off of the elevator, come to the break in hall, turn right and walk past the white board, turn left at the break in the hall, and follow to the end. If the shuttle driver is more familiar with coming on to campus off of Forbes Avenue by Hamburg Hall, travelling past Newell Simon Hall, and down the hill towards Doherty Hall, and driving up to the 1st floor of Wean, that is fine too! When you check in at your hotel, please let the front desk know of your need to get to CMU and your desired arrival time. They will inform you what time you should be in the front lobby for the appropriate shuttle. Please ask the shuttle driver to drop you off at the CMU entrance (Roberts Drive) off of Frew Street (by Schenley Park and Phipps Conservatory). This entrance brings you to the parking lot that is surrounded by Scaife / Porter / Hamerschlag and Roberts Hall(s). Hamerschlag Hall is the building with the circular tower on top of it. You can enter the double-green doors. If you are coming to the D-level, you can take the short flight of stairs you will see to your right, turn right, turn left at the elevator, and enter the wood and glass door. You can also take the elevator down to "D" and enter through the wood and glass door that will be facing you. Go straight through the door and turn right. When you check in at your hotel, please let the front desk know of your need to get to CMU and your desired arrival time. They will inform you what time you should be in the front lobby for the appropriate shuttle. Please ask the shuttle driver to drop you off at the CMU entrance (Roberts Drive) off of Frew Street (by Schenley Park and Phipps Conservatory). This entrance brings you to the parking lot that is surrounded by Scaife / Porter / Hamerschlag and Roberts Hall(s). Roberts Hall is located behind Scaife Hall (the building with the sloped brown and beige roof) and behind Hamerschlag Hall (the building with the circular tower). If you follow along the top-level railed sidewalk for Roberts Hall, it will lead you to the door where you will find the Atrium and the Singleton Room. Karen Lindenfelser's phone number is (412) 268-6716 -- or just 86716 on campus); Greg Ganger's phone number is (412) 268-1297 -- 81297 on campus.